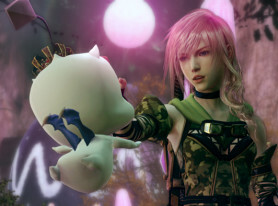 Lightning is back… and apparently she jiggles now. 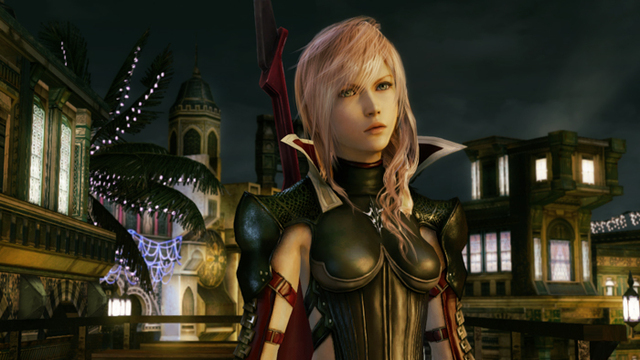 Lightning Returns: Final Fantasy XIII marks the last entry in what turned about to be a Final Fantasy XIII trilogy, and we got our hands on the game at the GameStop Expo to see what’s new. To those familiar with the trilogy, the game is about exactly what the title states. 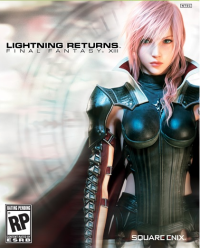 Lightning has returned, because if you remember, she pretty much switched roles with twin sister Sarah in between Final Fantasy XIII and Final Fantasy XIII-2. The demo at the expo put the re-tooled battle system front and center. 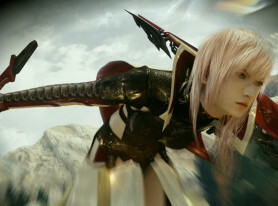 Now when heading into battle, Lightning can attack an enemy with the right trigger to open fights with a Preemptive Strike. 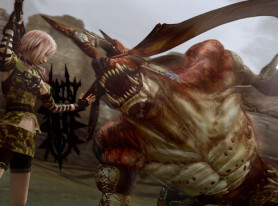 Unlike previous turn-based Final Fantasy battle systems, this doesn’t mean Lightning attacks first. It simply means the enemy attacked starts off with 10% less HP than they have, which we’d imagine will be adjusted depending on the stat categories and weapons you might have equipped. The active time battle system also received a bit of an overhaul. Now it seems to be just an active battle system. Attack commands are still performed with the face buttons, with the attack gauges on the left side constantly being depleted depending on how much of the gauge your attack uses up. 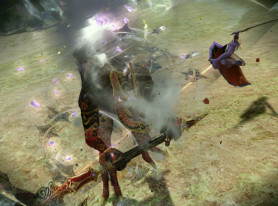 Attacks range from long-range magic attacks to short-rage melee-based moves which can be linked into combos to cause even more damage or “stagger” an enemy. 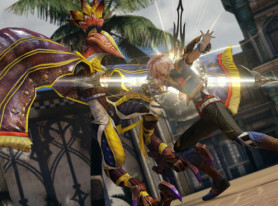 Like the FFXIII games before it, when an enemy is staggered, it’s virtually paralyzed giving players an opening for an all-out attack. The kinds of attack your character uses also depends on the class you’re on. 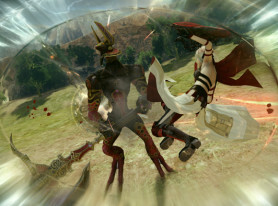 You can change classes using the left and right shoulder buttons in battle, which also affect your attacking gauge so you can link one class’ attacks with another. 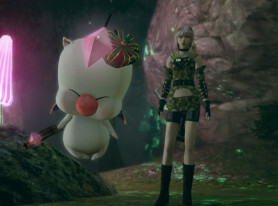 These power sets are called “schemata,” and this is pretty much the game’s version of the “Paradigm Shift” system from the other FFXIII games. 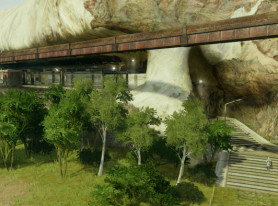 Without speculating too much, the area we tried out in the demo took place in what felt like another one of those linear dungeons that made Final Fantasy XIII uninteresting. 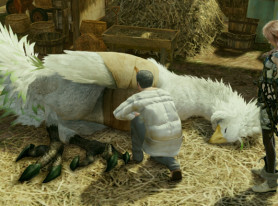 Now like a lot of action games before it, when in a dungeon, the task that must be performed at hand is displayed at the top left of the screen. Tasks like “defeat all monsters to open the next room” are on there, so once again, it’s almost impossible to get lost in the game. 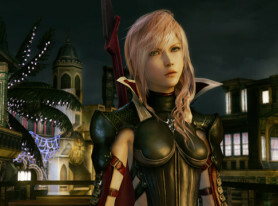 Lightning Returns: Final Fantasy XIII is shaping up to be quite an interesting title and is due for a February 11, 2014 release. For more on this game and others at the GameStop Expo, stay on SmashPad. 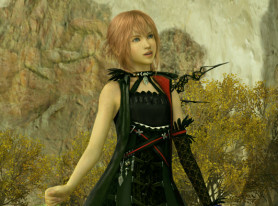 Lightning doing what she does. 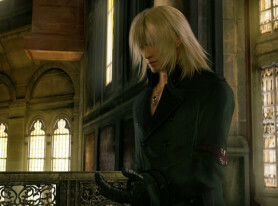 Snow looks more badass without a beanie. The battle system in this game is pretty cool.